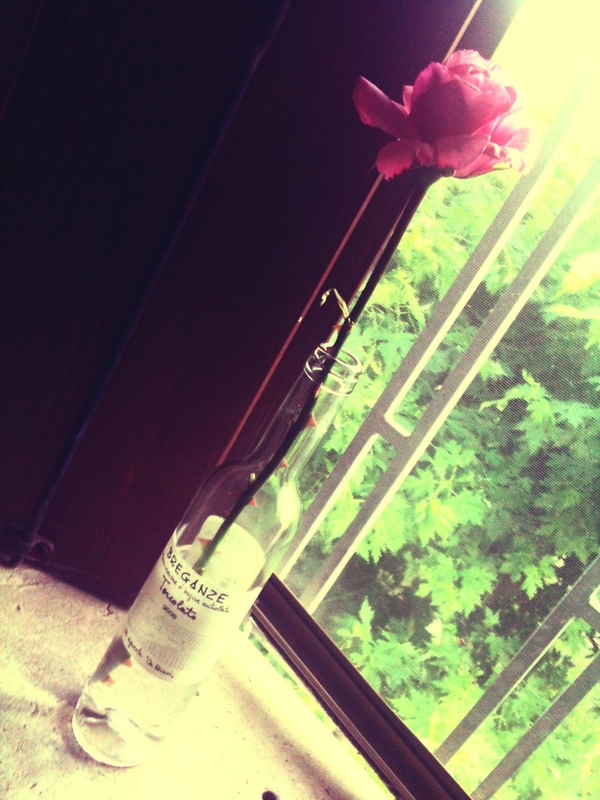 When I arrived home yesterday I found a beautiful pink rose in the vase on my outdoor table. It was a gift from my landlord who does not like roses to die on the vine if there are women around to enjoy them. Sometimes he leaves me little surprises like this which make me happy. I think when he finds the perfect rose or the color of rose that his wife loves best, he cuts and saves them for her. The idea that as the doctor arrives home from a long day at work he has a single, perfect, hand-picked rose for his beloved makes me even happier. After I finished a bottle of Torcolato I couldn’t throw it out because it was too cute. So I made it my new bud vase! Aw, just adds to you finding the perfect place to live when you moved to Italy. I have always imagined that European men were (are) more accomplished at sincere appreciation of women….If that’s not so, don’t burst my bubble. I have very few fantasies left!! !